Engraving by Agostino Veneziano, 31.7 x 50.7 S at L (Paris). Inscribed on the stone at the left: •AVGVSTINVS• / •VENETVS • DE / •MVSIS• / FACIEBAT• / 1518•_/ •A•V•. Heinecken, I, 1778, 628, 648, II, 1788, 95, as “The Cemetery,” or “The Memory of Death,” after Bandinelli, and hence traditionally called The Skeletons of Baccio. Bartsch, XIV, 1813, 320, 424. Le Blanc, 1854-1890, III, 77, as after Bandinelli. Passavant, VI, 1864, 60, 93. COLLECTIONS: Brussels, Bibliothèque Albert Ier (Poirier, 1964, 60, Pl. XXVII). Cambridge, Mass., Harvard Art Museums, Fogg Museum, R651 (inscribed in pencil at lower left: Held). Chatsworth, Vol. 2, p.43, no. 73 (inscribed in ink at lower left: 3.62 or I.62). PROVENANCE: Peter Lely (Lugt 2092). Florence, 511ss. London, 1857-5-2-18 (inscribed in ink at lower left: P. mariette 1684; see Lugt 1790). New Haven, Yale, 1966.94. New York, 49.97.145 (inscribed in ink at bottom center: GL Marietti 1673). Oxford, Christ Church, Vol. O 15. Paris, Eb 7 +. Rome, Fondo Corsini, Vol. 26 M 22, no. 30791 (Massari, 1989, 50, no. 14, 51, Fig. ), and no. 30792. Vienna, H.B.X.3, p.19, no. 541 (inscribed in ink at bottom center: P. Mariette 1688). LITERATURE: The literature on this engraving is largely the same as that on Rosso’s drawing that served as the disegno di stampa (D.1). Additional literature is inserted in the following discussion. From the inscription, Agostino Veneziano has always been recognized as the engraver of this print, but its design was ascribed to Baccio Bandinelli by Bartsch, Passavant, and by Nagler, X, 1841, 71, no. 111, Renouvier, 1854, 12, and Le Blanc, 1854/1888-1890, III, 77, no. 157. This attribution is dependent on two passages in Vasari; one in the “Life” of Bandinelli (1568, III, 426; Vasari-Milanesi, VI, 140, and n. 1, where Milanesi gives the traditional title of the print, The Skeletons): “Agostino Vineziano intagliatore di stampe gl’intagliasse una Cleopatra ignuda, e un’altra carta maggiore plena d’anatomie diverse, la quale le gli acquistò molta lode;” the other in Vasari’s passage on Agostino (1568, II, 302; Vasari-Milanesi, V, 416): “Agostino [Veneziano] fu trattenuto da Baccio Bandinelli scultore Fiorentino, che gli fece intagliore col suo disegno una notomia, che havea fatta d’ignudi secchi, e d’ossame di morti: e appresso una Cleopatra…” The Cleopatra by Agostino is dated 1515 (Bartsch, XIV, 1813, 158, 193). However, already in 1890 Ferri published the drawing in the Uffizi, clearly the model for the print, as Rosso’s, as did Berenson in 1903, Ferri in 1917, Kusenberg in 1931, and De Witt in 1938, p.70. Kusenberg, 1931, 183, n. 28, and Becherucci, 1944, 26 (1949, 26), commented that the drawing was formerly attributed to Bandinelli, but at least since 1890, when Ferri published it, it has been always recognized as Rosso’s, except recently (1994) by Franklin, who would associate it with Bandinelli. However, in 1890 and in the same publication (p.31), Ferri published the pen and ink copy of this drawing, Uffizi 14669F (see below), as by Bandinelli and stated that it was the model for Agostino Veneziano’s print. In 1917, Ferri (under no. 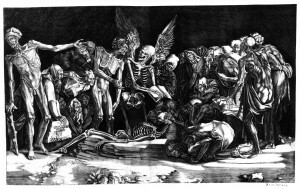 14) recognized the copy again as by Bandinelli but now as the model for Marco Dente’s engraving, while Rosso’s drawing was designated correctly as the model for Agostino’s print. Petrucci, 1964, 29, 31, 33, as done in Rome after a design now attributed to Rosso. Ciardi Dupré, 1966, 153-154, believes that there may have been another drawing actually by Bandinelli showing what Vasari describes and a print made from it by Agostino Veneziano that is also lost. This is possible but seems unlikely. It is more reasonable to believe that Vasari, who mentions that Bandinelli employed Agostino and engraved his Cleopatra, dated 1515, simply erred in giving the design of the Disputation of 1518 to Bandinelli. Campbell, in RISD, 1973, 107, Fig. 108, no. 118 (New Haven). Borea, 1980, 247, no. 608 and under no. 609, 245, Fig. (Florence), as after Rosso’s drawing but with a discussion of the attribution to Bandinelli. Dacos, 1984, 353, 361, n. 45. Carroll, 1987, 9, 11, 17, 19, 21, 24, 37, 38, 39, 54-58, no. 2, with Fig. (London). Carroll, 1989, 7-8, 10, 12, Fig. 2 (London). Massari, 1989, 50-52, no. 14, Fig. a (Rome, Fondo Corsini), as after Rosso. Brilli, 1994, 12, Fig. (Uffizi), as after Rosso. Costamagna, 1994, 33, 36, as after Rosso. On the relatively minor changes and additions in Agostino’s print when compared with Rosso’s drawing, see D.1. The very finished character of the drawing almost certainly indicates that it was made as a model for the print. While Rosso’s drawing bears the date 1517, the print is inscribed 1518. Agostino appears to have been in Florence in 1515 and part of 1516 and then in the latter year went to Rome. Rosso went to Rome early in 1524; there is no recorded earlier trip by him there. It is most likely that the drawing was made especially for Agostino Veneziano. Rosso could have met him in Florence on an unrecorded trip and the print could have been made there in 1517 and 1518, or the drawing could have been sent to Agostino in Rome on the suggestion and recommendation of Bandinelli. It would then have been sent to Rome. Nothing in Rosso’s art seems to indicate that he was in Rome prior to his documented sojourn there. Wardropper, 1985, viii, 56-57, Fig. 55, captioned his illustration as of the 1520s. Davis’s belief (1988, 12, 80-81, Fig. 22a, London, under no. 22) that the date on the print is related to Rosso’s invention while the print was actually made between 1524 and 1527 seems to me ill founded. He gave no evidence for the use of a date for the same reason on any other print, nor did he account, in the light of this meaning of the date, for the absence of Rosso’s name on the engraving. Davis said that, executed in 1518, the engraving “would seem anomalous as the only print from Rosso’s Florentine period.” But this was no more of an anomaly in Rosso’s case than it was in Sarto’s or Michelangelo’s with regard to the prints that Agostino Veneziano made from their compositions. Karpinski, 1988, 172, 173, as large compared to Roman prints but average compared to Florentine; as possibly made in Florence in collaboration with Rosso; and as resembling a niello. Kornell, 1989, 845, Figs. 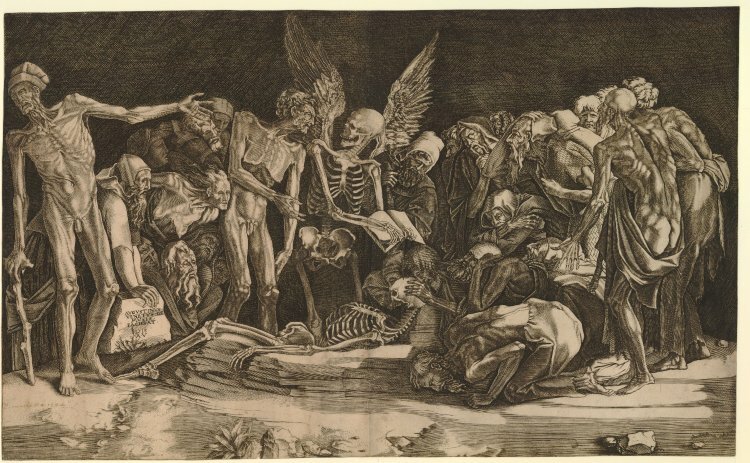 55, 57, 846-847, recognized the use of the standing figure at the far left and the head of the hermaphroditic figure to the left of the winged skeleton for the Marasmic man in Berangario’s Commentaria of 1521. Ciardi, 1994, 55, 95, n. 114, as the frontispiece to a book on anatomy even if it is also an allegory. Landau, in Landau and Parshall, 1994, 159-160, 161, Fig. 170 (London), agreed with Karpinski that the print was made in Florence, and supervised by Rosso. 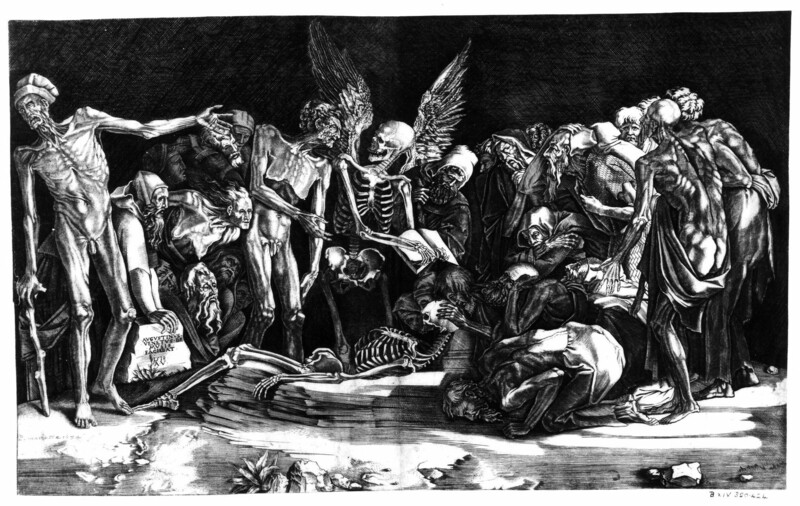 For another engraved version of the Disputation by Marco Dente, see E.51. COPIES, DRAWINGS: Berlin, Kupferstichkabinett, Inv. 2000-1902-5222. 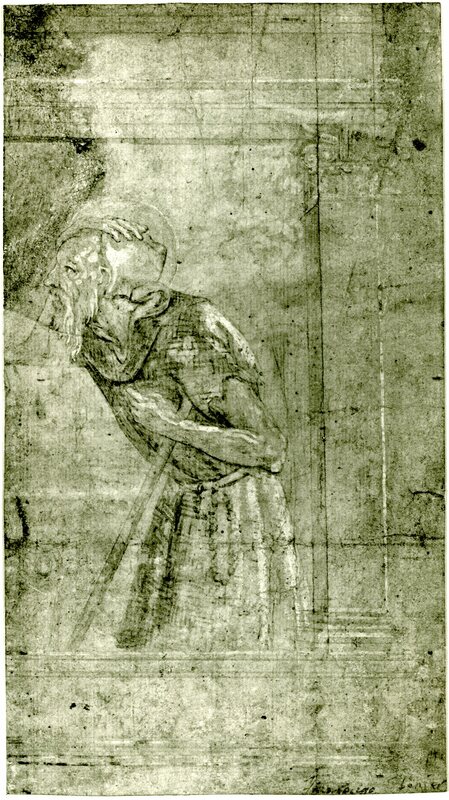 Old bearded male saint with a crutch under his left arm and his right hand on his head, set within the right end of a frame (Fig.E.109, Copy, Berlin). Point of brush, dark grey wash and white heightening over traces of black chalk (or silver point), on grey prepared paper, 22.2 x 12.4. Two unclear inscriptions in ink and pencil in the lower right corner. PROVENANCE: A. von Beckerath Collection. LITERATURE: Franklin, 1988, 326, no. 2. Attributed to the School of Milan, fifteenth century, the drawing copies, with some changes to turn him into a saint, perhaps St. Onofrius as suggested in the Berlin drawing room, the figure wearing such a garment of woven fronds at the right in Agostino Veneziano’s engraving of 1518. This woven garment does not appear in Rosso’s drawing nor in Marco Dente’s print. The halo, the garment of woven palm fronds and the crutch identify the figure as St. Paul the Hermit. In paintings around this time, St. Onofrius’s garment is composed of leaves that cover only the abdomen of the saint. Oxford, Ashmolean, A 11. Pen and brown ink, 28.5 x. 43.8. LITERATURE: Macandrew, 1980, 199, A 11. Formerly Paris, André de Hevesy Collection. Red chalk, 24.5 x 22.6. LITERATURE: Kusenberg, 1931, 149, no. 11, as a partial copy of Agostino Veneziano’s engraving or Marco Dente’s print. De Hevesy attributed the drawing to Jean Cousin.